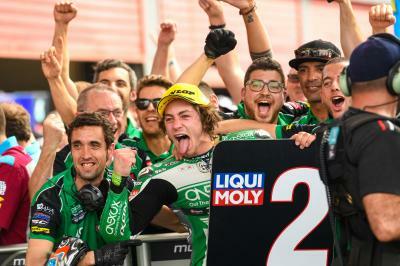 Flexbox HP 40’s Lorenzo Baldassarri continued his perfect start the 2019 Moto2™ World Championship with a calculated ride to claim victory at the Gran Premio Motul de la República Argentina. The Italian eventually took the chequered flag over a second clear of Remy Gardner (ONEXOX TKKR SAG Team), who stood on the podium for the first time in his career, almost 27 years on from dad Wayne’s last podium at the 1992 South African Grand Prix. 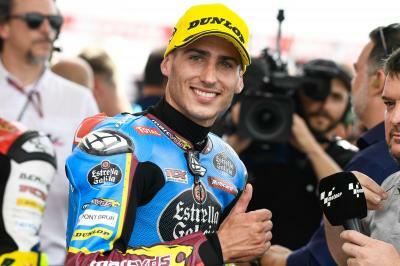 Disaster struck before the race even got started for poleman Xavi Vierge after his EG 0,0 Marc VDS Kalex broke down on the Warm Up lap, leaving an open space in pole position as the race got started. 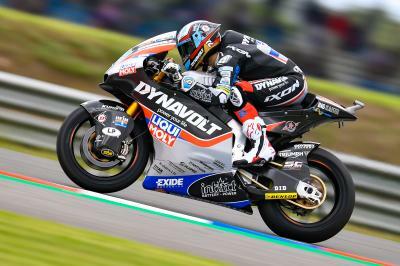 Dynavolt Intact GP’s Marcel Schrötter took the holeshot with Vierge absent but Federal Oil Gresini Moto2’s Sam Lowes tried his best to take the lead into Turn 1 but got in way too hot, running wide and eventually taking up sixth place. It didn’t take long for Gardner to hit the front of the race though, with the Australian diving past Schrötter before starting to full clear. 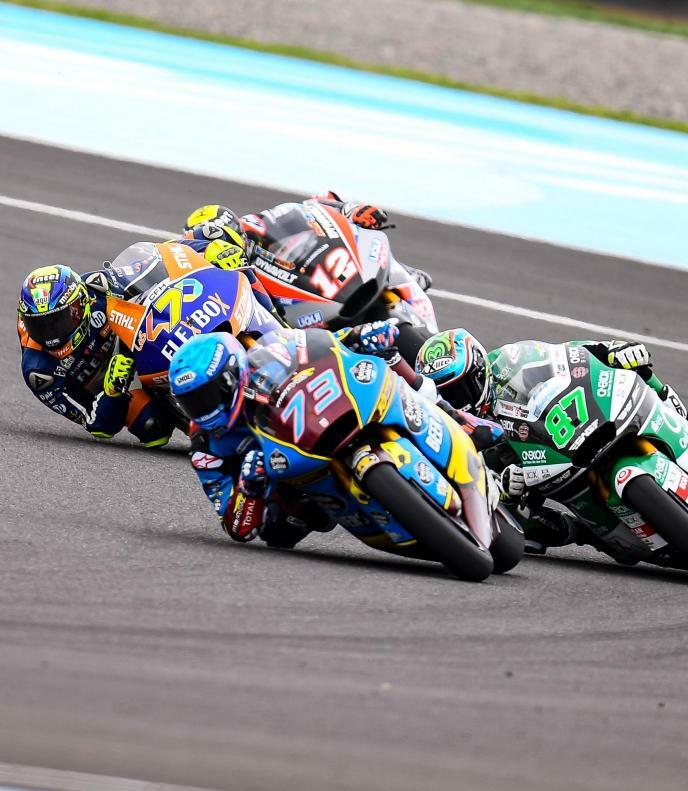 Schrötter, EG 0,0 Marc VDS’ Alex Marquez and Baldassarri didn’t let Gardner check out though and the front four began an almighty scrap. Meanwhile, on Lap 6 Dynavolt Intact GP’s Tom Lüthi crashed out at Turn 7, unhurt, after clipping the rear wheel of Red Bull KTM Ajo’s Brad Binder in front of him. Britain’s Lowes also crashed out at the same corner on the same lap after tucking the front end with both in the hunt for fifth place. At the front, Gardner, Schrötter and Marquez all had their turns at leading, with some super aggressive moves been placed on one and other, all while Baldassarri sat and watched from fourth place. Then, with eight laps remaining the Italian started to make his way forward, first moving past Marquez to go into third. Strong moves coming in from all members of the leading group! ???? Three laps later, Baldassarri was up to second having slipped past the German and was sat in behind race leader Gardner, with the front three now having broken clear. A lap later, and with four left, Baldassarri made his move for the lead. On the run into Turn 5, the Qatar GP winner squeezed Gardner out, leaving him no room whatsoever and forcing the Aussie to run wide and allowing Baldassarri to hit the front for the first time; firm but fair. 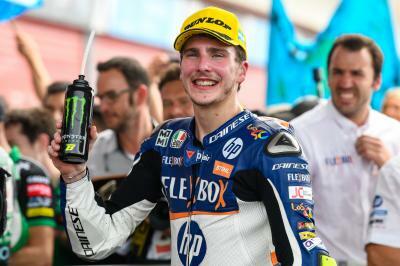 He hung onto the chequered flag and made it 50 points from the opening two rounds of the season, to hold a 17-point championship advantage at this early stage. His nearest title rival is Gardner who battled back from third place to second over the line and move into second place in the championship as a result. Marquez took the final podium spot after benefiting from a coming together between Schrötter and Binder with two laps remaining. American Racing KTM’s Iker Lecuona took fourth place before Binder and then Schrötter, who were split by a tenth. 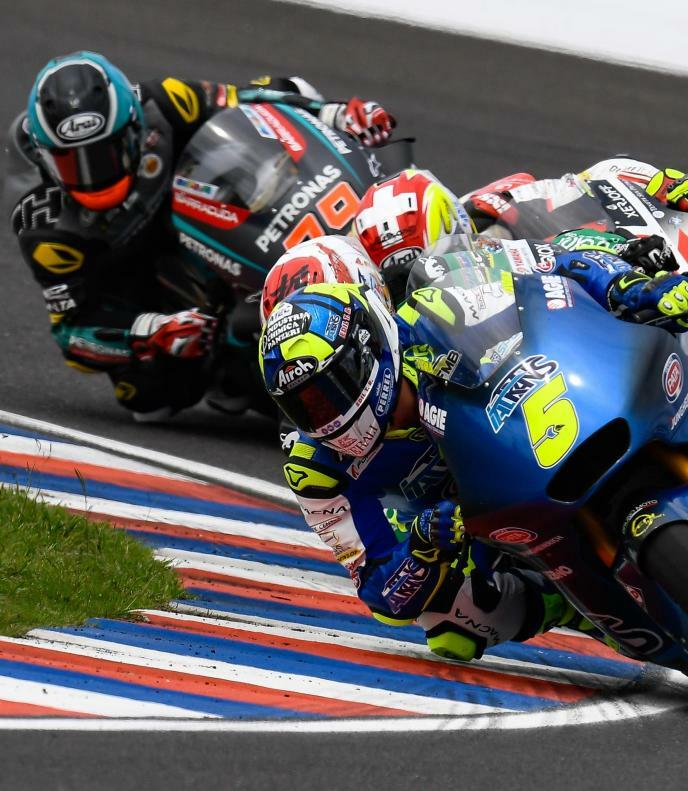 SKY Racing Team VR46’s Luca Marini ended seventh, with Jorge Navarro (Beta Tools Speed Up) in eighth and rookie Enea Bastianini (Italtrans Racing Team) in ninth. 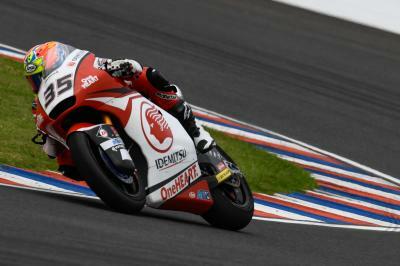 Rounding out the top ten, after a career-best ride, was Thailand’s Somkiat Chantra aboard his Idemitsu Honda Team Asia Kalex.